The Oscars, the Grammys, the Emmys and the Tonys. On the surface, they may be about excellence in cinema, theater and music, but we all know the most exciting part of these award shows is what extravagant outfits the biggest stars will show off on the red carpet. From Lady Gaga’s eyebrow-raising ensembles, to Sarah Jessica Parker’s flowing gowns, we love to see what Hollywood’s darlings will wear next. Although the dresses are the centerpiece of red carpet fashion, it’s the accessories that can either pull together a look or overwhelm it into something atrocious. And despite the fact that designer dresses cost thousands of dollars, it can be the actresses’ accessories, jewelry specifically, that hold the most value. Read on to discover the most expensive jewelry ever worn on the red carpet. Reese Witherspoon’s sleek and simple look at the 2014 Golden Globes may look inexpensive compared to some of the other stars, but she was actually wearing $3.7 million in jewelry, including a pair of 4-carat diamond earrings, a 10-carat diamond ring, and three stacked diamond bracelets. Witherspoon got the jewels from the world renowned Harry Winston, who revolutionized the jewelry industry since he opened the doors to his New York City shop in 1932. Winston was actually the first jeweler to get his pieces on the red carpet, so it’s only fitting that some of the most expensive pieces of today still come from his brand. Nicole Kidman embodied nothing but true Hollywood glamour at the 2008 Oscars in her L’Wren Scott necklace, made of over 7,600 diamonds. The stunning necklace took 6,200 incredibly long hours to create (that’s 258 straight days) and was custom made just for Kidman. She paired the extravagant necklace with a simple, elegant, black Balenciaga dress. Modern Family actress, Sofia Vergara also wore $7 million in jewels on the red carpet, specifically to the 2013 Emmys. In addition to her stunning red Vera Wang mermaid gown, Vergara wore giant ruby, sapphire and emerald earrings; a 21-carat diamond ring; and a 40-carat emerald and diamond ring from jeweler, Lorraine Schwartz. On the red carpet, E!‘s Giuliana Rancic told Vergara, “Your dress has the hardest job on this red carpet keeping all that sexiness under control!” The then 41-year-old laughed and replied, ”It’s doing a very hard job!” It was no big deal for Vergara to be wearing jewelry worth the same as a dozen large houses. Another actress looking striking in red, Amy Adams wore a deep cut Valentino gown, along with her $8 million in jewelry to the 2014 Golden Globes. She showed off pieces from Lorraine Schwartz, including a 30-carat diamond pendant, a 12-carat diamond ring and 10-carat diamond earrings. Besides winning one of the most fashionable and blinged-out looks of the night, Adams also went home with a Golden Globe for the Critic’s Choice Movie Award for American Hustle. Red gowns and astonishingly expensive jewelry must go hand-in-hand because Anne Hathaway also paired the two together at the 2011 Oscars. Hathaway wore $10 million worth in jewels, including a Tiffany & Co. 94-carat diamond necklace, a Tiffany Legacy diamond ring and 10-carat diamond earrings. Hathaway didn’t have to pay a dime for the jewelry, however, and it’s actually rumored that Tiffany & Co. paid her $750,000 to wear them. Wear expensive jewelry for the night, earn 10 years of a middle class person’s salary… sounds good to me! At the 1998 Oscars, Gloria Stuart had the honor of wearing an exact replica of the “Heart of the Ocean” necklace from the Titanic, made by who other than Harry Winston. With a centerpiece of a huge sapphire surrounded by diamonds, the necklace was worth a shocking $20 million. Stuart, who portrayed the elderly Rose in the Titanic, went home with the Oscar for Best Supporting Actress that night. Stuart has a long and successful career, with Titanic only as her crowning achievement. She passed away in 2012, when she was 100 years old. 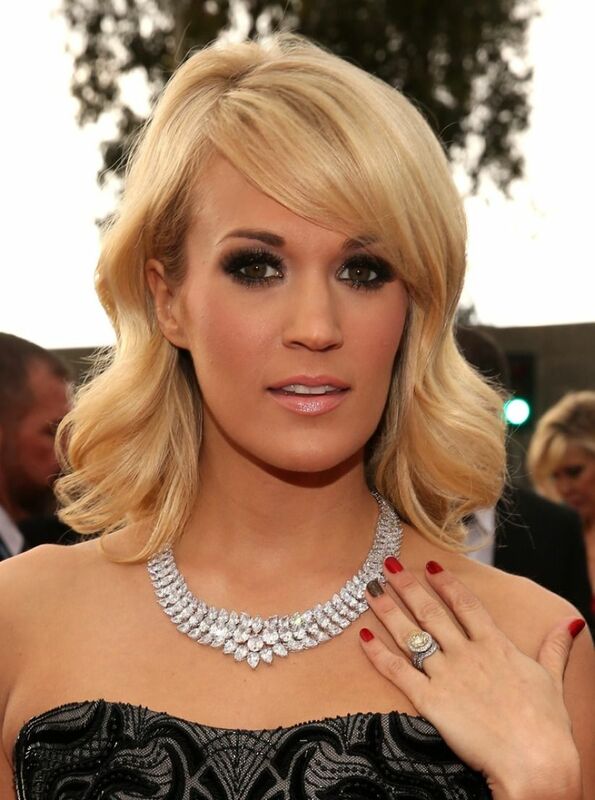 At the 2013 Grammys, country star, Carrie Underwood donned $31 million in jewelry. Just her necklace, designed by Jonathan Arndt, included 381 carats of diamonds. “It’s worth more than me!” she said at the event. Underwood let the necklace take the spotlight, pairing it with a strapless Roberto Cavalli dress. Besides showing off her millions of dollars in jewels, Underwood also gave a performance and earned the Grammy for Best Country Solo Performance. What an unforgettable night!